(TORONTO, ON – August 8, 2014) The Lexus IS was imagined and engineered with a single mission – to deliver complete driving enjoyment – and that’s exactly what it does. Canadians agree – helping the IS achieve record sales months this year. Now, with additional standard features and enhanced option packages for 2015 plus plenty of trim levels from which to choose – including up to three F SPORT packages – it’s a great time to discover just how dynamic and stunning luxury sedan can be. The Lexus IS 250 (starting MSRP $37,900) is available in three packages, including F SPORT Series 1 and 2. The Lexus IS 250 AWD (starting MSRP $40,500) is available in six packages, including F SPORT Series 1, 2 and 3. The Lexus IS 350 (starting MSRP $50,350) is available exclusively as F SPORT Series 2 and 3. The Lexus IS 350 AWD (starting MSRP $47,400) is available in six packages, including F SPORT Series 1, 2 and 3. All Lexus IS models are enhanced with a new centre console kneepad for additional comfort and support during high-performance driving. Interiors are enhanced with new trim, including piano black trim on the instrument panel and around window switches. The backup camera provides even more useful information with a new, dynamic grid line in the display. All F SPORT packages are now equipped with front sport seats with heating and ventilation, as well as F SPORT trunk badges. All models come standard equipped with LED fog lamps. Choice of engines: A 204 peak horsepower 2.5L V6 or 306 peak horsepower 3.5L V6. Both engines offered in rear-wheel-drive and all-wheel-drive models. The rear-wheel-drive configuration provides exceptional weight distribution for sharper handling and performance, while the all-wheel-drive system enhances stability with additional traction, without sacrificing drivability. Steering and rear suspension inspired by the Lexus GS to deliver exceptional handling. Driver-focused, ergonomic interior features lower driver position for improved comfort and driving experience. Impressive luggage space plus 60/40 split folding rear seats for cargo-carrying versatility. 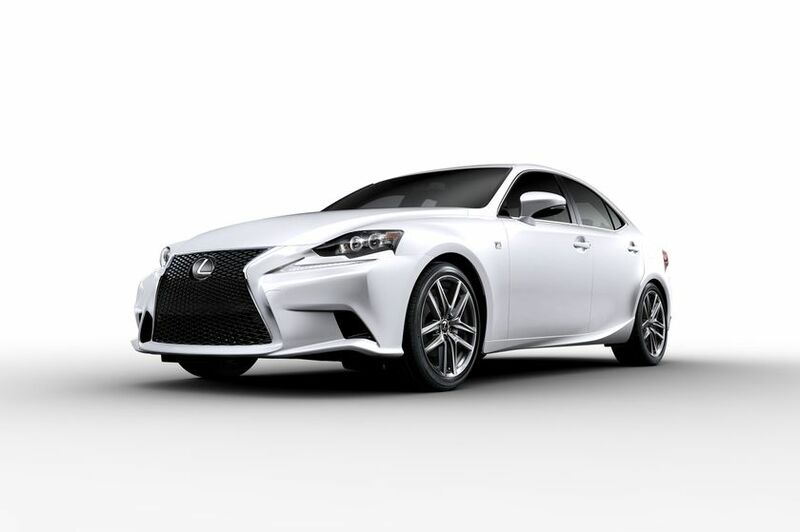 F SPORT packages – inspired by Lexus LFA Supercar and track tested at Nurburgring – feature an available 8-speed auto transmission and G-AI control, which actively matches gear changes to G-forces generated during driving (RWD models). F SPORT packages also feature special interior and exterior styling and performance enhancements, including unique seats designed to combine excellent comfort with outstanding lateral holding performance. Intuitive Human Machine Interfaces and user friendly screens. Luxury appointments include the Lexus analogue clock and electrostatic switches. All 2015 Lexus IS models feature luxury amenities and performance enhancements, including: Vehicle Dynamics Integrated Management (VDIM); user-selectable drive modes; dual-zone automatic climate control; Lexus Display Audio system with steering wheel-mounted audio controls; Bluetooth connectivity; NuLuxe seat surfaces; electro-chromatic rear view mirror; power windows with water repellant front door glass; leather-wrapped steering wheel with paddle shifters; Lexus Smart Key system with Push Button Start; integrated garage door opener; eight airbags, an onboard first aid kit, six active safety technologies including Vehicle Stability Control, Traction Control and Electronic Brakeforce Distribution, and other safety features; auto-leveling HID headlamps; dual power remote heated exterior mirrors; and more. F SPORT packages enhance the IS with a specially-tuned adaptive suspension system plus many unique F SPORT details, including distinctive aluminum alloy wheels, steering wheel and shift knob, interior trim, scuff plates, an LFA Inspired digital instrument cluster, and more. For full vehicle and package features and specifications, visit lexus.ca/is.